I love going to the theatre but am a terrible fidget. So when I discover that a play will last an hour and 40 minutes without an interval my sweat glands go into overdrive. I am also convinced that Ryanair based their seat designs on theatre seating. That said, usually the draw of the production outweighs my fears of getting thrombosis. My favourite theatre is the Abbey in Dublin even though its exterior looks brutalist, which in some ways reflects the area's general resistance to the inevitable march towards gentrification. The plays I most enjoy are those which provide historical or social commentary on actual events such as Juno And The Paycock by Sean O'Casey or Observe The Sons Of Ulster Marching Towards The Somme by Frank McGuinness. At the Lyric last week I attended the Belfast premiere of A Day In May, which I would describe more as a docu-drama than a play. A Day In May is based on a book written by former RTE chief news reporter Charlie Bird and it's a collection of personal narratives from those impacted by the struggle to achieve equality for the gay, lesbian, bisexual and transgendered community in Ireland. The title of the book is derived from May 23, 2015 when the Irish electorate voted by a whopping 62% to establish marriage equality by popular vote. The playwright and Sunday Business Post commentator Colin Murphy turned Bird's book into a documentary-drama. Murphy is well suited to these docu-dramas having tackled both the bailout and the legendary deal between Charles J Haughey and the maverick independent Dublin TD, the late Tony Gregory. At first glance a story about a very long social and human rights struggle combined with politics and campaigning wouldn't have most people clamouring for tickets. But A Day In May was riveting to watch and a packed Lyric Theatre seemed to agree. I attended with two of the author's brothers, one of whom only relatively recently came out as gay. Both brothers cried during various parts of the performance. Being of thran Ulster stock I struggled to know what to do with all this bare emotion, so I gave a very masculine northern tap onto the shoulders of both siblings. There was a certain poignancy to hosting the performance in Belfast. The issue of marriage equality still remains a pipe-dream within Northern Ireland - despite a majority of people supporting a change in the law. It is totally iniquitous and somewhat duplicitous of the DUP to deny Northern Ireland citizens the same rights which are available to all other citizens throughout Britain. The prejudices of the DUP should have no standing, legal or moral, when it comes to the British Government ensuring that all in the UK are treated equally in law. The purpose of this column is not to review the document-drama - there are far more eloquent writers more capable of that. No, it's more to make the overt political point that issues such as marriage equality are not just about the LGBT community, but about the whole community. That's the message of A Day In May. No one should feel threatened by a matter of equality and particularly not about a matter of love. 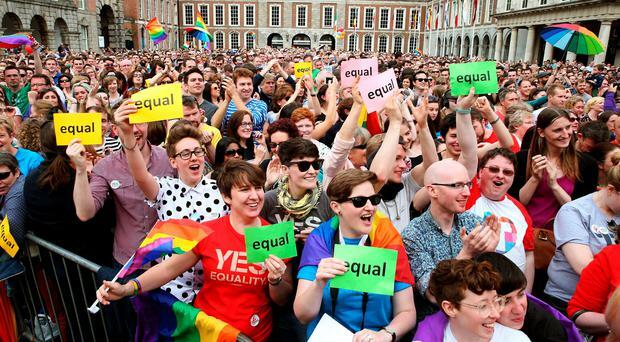 It is clear that is how the LGBT campaigners won over the general population in the Republic of Ireland. And to achieve that win they told the stories of their own journeys and their own families. LGBT people were not some kind of "others", they were simply a part of the weave of human fabric that makes up Irish society. They were not asking for more than anyone else, just the same. I confessed at the Lyric after party reception to my hosts that in 2015 I hadn't been convinced by the need for marriage equality when civil partnerships were available. I saw the issue in legal terms, not as a matter of the heart or equality. Then, driving up from Dublin a few days ahead of the referendum, I heard one of the most remarkable radio interviews ever on Newstalk. It was a discussion with Fine Gael general secretary Tom Curran and his son Finnian. During the conversation Curran described himself as a committed Catholic, bound by the love of God not solely by Church dogma. He said that when Finnian told him and his wife that he was gay, the only phrase that kept going through his head was: "You are carved in the palm of my hand." It's a phrase from Isaiah. There is a preface to it: "I will not forget you." Tom Curran's words struck me more than any of the major debates I had listened to or watched. Even the eloquence of Mary McAleese had not impacted on me. It was so simple that any parent, grandparent, godparent or guardian could empathise with its sentiment. How could someone so inextricably linked to your own being be less equal than another? How could you forget someone carved into your palm? At that point I became convinced marriage equality threatens no one. It is simply a right that should be afforded to all. The audience at the Lyric could clearly identify with the personal narratives being played out on the stage. Particularly distressing were those stories which told of suicide and suicide attempts; the loneliness and self-destruction brought about by unhappiness. Outside the theatre there was a stand for the loveequalityni.org manned by those who are tireless in their commitment to achieve equality. They are as indefatigable as the infamous "unsinkable" Molly Brown of Titanic fame. But how much longer should they have to wait? How much longer can they be denied? There is a great line in Juno And The Paycock from the much put upon and hard working Juno - "It's nearly time we had a little less respect for the dead, an' a little more regard for the living." In a place that can seem so obsessive about the past maybe we should have a little more regard for the living - especially those denied their rights.